Cesium-131 by Isoray is a Smart Choice for All Types of Brachytherapy. Brachytherapy with Cesium-131 by Isoray is yielding great outcomes. Learn more here and reach out to us for more information. “The Determination of Radiobiologically Optimized Half-lives for Radionuclides Used in Permanent Brachytherapy Implants.” by Armpilia CI, Dale RG, Coles IP, et al., Int. J. Radiation Oncology Biol. Phys. 2003; 55 (2): 378-385. Dr. Armpilia reports on and derives equations for the formal mathematics of Biologic Effective Dose. According to the mathematical models that take into account variables related to the ability of certain cancers to grow aggressively even while being irradiated, Dr. Armpilia concludes that Cs-131 will successfully treat a wider range of possible cancer types than other brachytherapy isotopes. “Cs-131 Prostate Brachytherapy and Treatment Plan Parameters.” Sutlief S and Wallner K. Medical Physics 2007; 34(6):2431. Drs. Sutlief and Wallner from Seattle report on a dosimetric study of Cesium-131 implants. They conclude that Cesium implants result in fewer “hotspots” than the other isotopes, are resistant to small errors in source placement, and require fewer seeds for large prostates. Dr. Yaparpalvi from New York City runs a dosimetric study that reveals advantages to Cesium prostate brachytherapy over brachytherapy with other available isotopes. Again, the homogeneity of dose and the very low rate of “hot spots” are highly attractive from a dosimetric point of view. “Dosimetric Comparison of Cesium-131 and Palladium-103 for Permanent Prostate Brachytherapy.” Musmacher JS, et al. Int. J. Radiation Oncology Biol. Phys. 2007;69(3):S730-1. Mr. Musmacher and his physician colleagues (Smithtown, NY) report that Cesium-131 delivers a more homogenous dosimetric profile than Palladium-103, while maintaining essentially equivalent gland coverage. Dr. Moran from Chicago reports on 104 patients implanted with Cesium-131 for localized prostate cancer. Serum PSAs in these patients dropped precipitously as expected given the typical response of PSA to successful brachytherapy. Patient-reported urinary symptoms had returned to pre-treatment levels in the great majority of patients by six months, which may represent an advantage over other brachytherapy isotopes. “Clinical Outcomes of a Phase II, Multi-Institutional Cesium-131 Premanent Prostate Brachytherapy Trial“, B. Prestidge, Brachytherapy 2007;6(2):78. Dr. Prestidge, from San Antonio, reported in 2007 on the ground-breaking 100-patient clinical study known as the “Cesium Monotherapy Trial.”They noted only one (1%) RTOG grade 3 rectal complication, and also noted the duration of urinary side-effects to last approximately six months. Symptoms were statistically correlated to the dose of Cs-131 delivered. “Dosimetric Evaluation of Permanent Prostate Brachytherapy Using Cs-131 Sources” by Steven Kurtzman, M.D. Int. J. Radiation Oncology Biol. Phys.;66(3):S395. Dr. Kurtzman, of San Mateo, California, studied the dosimetry of 58 patients implanted with Cs-131. He noted the dose “inhomogeneity” – as measured by the dosimetric concept “V150” – to be very low as compared to other brachytherapy isotopes. “Cesium-131 Permanent Prostate Brachytherapy: An Initial Report.” Prestidge B.R., Bice W.S., Jurkovic I., et al. “, Int. J. Radiation Oncology Biol. Phys. 2005; 63 (1): 5336-5337. In the first report related to the Cesium Monotherapy Trial (see above), Dr. Prestidge reports in 2005 on the first large scale Cesium study, including overall doses delivered, activity implanted, and resultant dosimetric parameters. Dr. DeFoe, from the University of Pittsburgh, reports on a series of 94 patients treated with Cesium-131 prostate brachytherapy. In agreement with other, similar, studies, the Cesium treated patients overcome brachytherapy-related urinary symptoms within six months. Their data suggests an early cessation of urinary side effects because of the short half-life of Cesium-131. “Point: Cesium-131: Ready for Prime Time.” Bice WS. Brachytherapy 2009;8(1):1-3. Dr. Bice argues that the potential advantages of Cesium-131 prostate brachytherapy are important to consider – especially to a clinical culture that may not be interested in a “new” brachytherapy isotope. “IPSS Trends for Cs-131 Permanent Prostate Brachytherapy.” Jones A, et al. Brachytherapy 2008;7(2):194. Dr. Jones from Danville, PA, reports on 90 patients with prostate cancer treated with Cesium-131 brachytherapy. He and his colleagues conclude that the short half-life of Cesium-131 contributes to a shorter duration of the typical urinary side-effects of brachytherapy. “Early Outcomes of Prostate Seed Implants with 131Cs: Toxicity and Initial PSA Dynamics from a Single Institution.” Platta CS, et al. Int. J. Radiation Oncology Biol. Phys. 2008;72(S1):S323-4. Dr. Platta from the University of Wisconsin describes the outcomes of 67 patients treated with Cesium-131 prostate brachytherapy. He reports that the rate of PSA decline following treatment with Cesium-131 may be faster than for other brachytherapy radioisotopes. Because of the quick resolution of urinary side effects, Dr. Platta and his colleagues call for larger scale studies into Cesium-131 prostate brachytherapy. Summary: Compares the cost-effectiveness of Cs-131 versus SRT for radiation delivery following surgery for the treatment of brain metasteses. Implementation and early clinical results utilizing Cs-131 permanent interstitial implants for gynecologic malignancies. Gynecol Oncol. 2014 May;133(2):268-73. doi: 10.1016/j.ygyno.2014.02.015. Epub 2014 Feb 17. Feddock J, Aryal P, Wooten C, Randall M.
Permanent interstitial reirradiation with Au-198 seeds in patients with post-radiation locally recurrent uterine carcinoma. J Radiat Res. 2013 Mar; 54(2): 299–306. Okazawa K, Yuasa-Nakagawa K, Yoshimura R, Shibuya H.
Allen MS, Darling GE, Pechet TT, et al. Morbidity and mortality of major pulmonary resections in patients with early-stage lung cancer; initial results of the randomized, prospective ACOSOG Z0030 trial. Ann Thorac Surg 2006;81:1013e1019. Ginsberg RJ, Rubinstein LV. Lung Cancer Study Group. Randomized trial of lobectomy versus limited resection for T1 N0 non-small cell lung cancer. Ann Thorac Surg 1995;60:615e622. Chen A, Galloway M, Landreneau R, et al. Intraoperative 125I brachytherapy for high-risk stage I non-small cell lung carcinoma. Int J Radiat Oncol Biol Phys 1999;44:1057e1063. Shibamoto Y, Hashizume C, Baba F, et al. Stereotactic body radiotherapy using a radiobiology-based regimen for stage I non- small cell lung cancer: A multicenter study.Cancer 2012;118:2078e2084. Haasbeek CJ, Lagerwaard FJ, Slotman BJ, Senan S. Outcomes of stereotactic ablative radiotherapy for centrally located early-stage lung cancer. J Thorac Oncol 2011;6:2036e2043. Baumann P, Nyman J, Hoyer M, et al. Outcome in a prospective phase II trial of medically inoperable stage I non-small-cell lung cancer patients treated with stereotactic body radiotherapy. J Clin Oncol 2009;27:3290e3296. Mohiuddin K, Haneuse S, Sofer T, et al. Relationship between margin distance and local recurrence among patients undergoing wedge resection for small (#2 cm) non-small cell lung cancer. J Thorac Cardiovasc Surg 2014;147:1169e1175. Fernando HC, Landreneau RJ, Mandrekar SJ, et al. 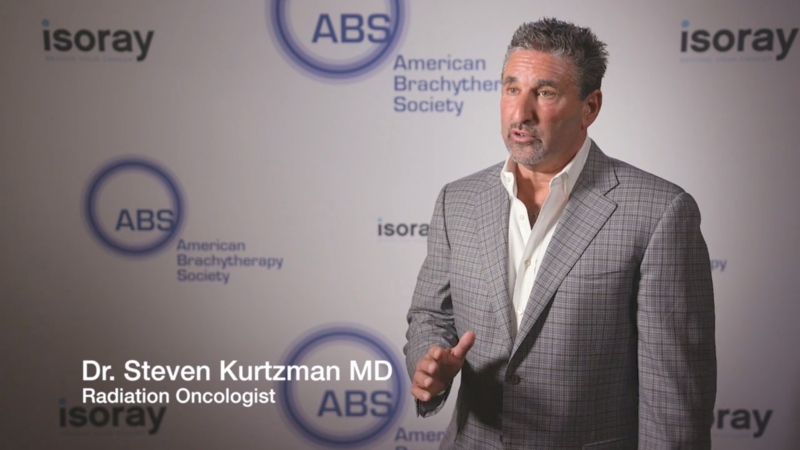 Impact of brachytherapy on local recurrence rates after sublobar resection: Results from ACOSOG Z4032 (Alliance), a phase III randomized trial for high-risk operable non-small-cell lung cancer. J Clin Oncol 2014;32:2456e2462.1070e1076. Learn about how Cesium-131 by Isoray is being used in radiation treatment. Doctors around the country use Cesium-131 by Isoray to treat a wide range of cancers. A novel approach for radiation delivery. An innovative solution for recurrent cancers. Delivering personalized radiation to tightly controlled areas.